Just hours later, scientists produced the first focused images with these precision lenses—the largest is 1.1 meters in diameter—during this early test spin, marking an important “first light” milestone for the Dark Energy Spectroscopic Instrument, or DESI. This first batch of images homed in on the Whirlpool Galaxy to demonstrate the quality of the new lenses. 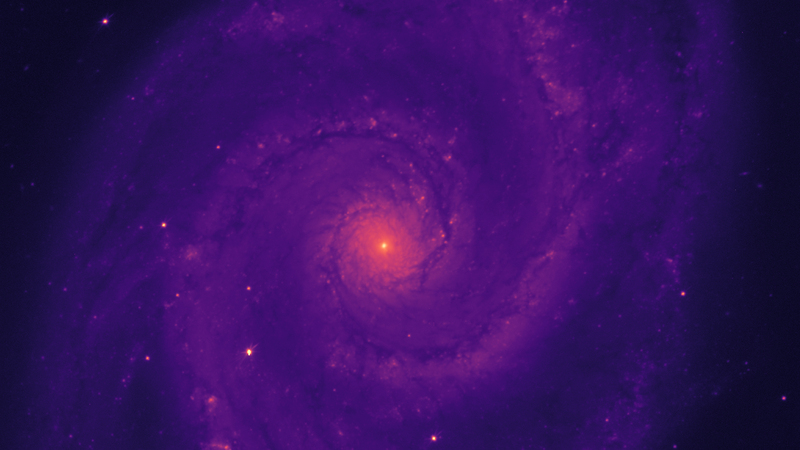 An r-band filter was used to capture the red light in DESI’s "first light" image of the Whirlpool Galaxy, Messier 51. This phase of the project will continue for about six weeks and will require the efforts of several onsite scientists and remote observers, notes Rockosi, a professor of astronomy and astrophysics at UC Santa Cruz. DESI’s array of 5000 independently swiveling robotic positioners, each carrying a thin fiber-optic cable, will automatically move into preset positions with accuracy to within several microns (millionths of a meter). Each positioner is programed to point its fiber-optic cable at an object to gather its light. DESI’s lenses are housed in a barrel-shaped device known as a corrector that is attached above the telescope’s primary mirror, and the corrector is moved and focused by a surrounding device known as a hexapod. Fermi National Accelerator Laboratory researchers led the design, construction and initial testing of the corrector barrel, hexapod and supporting structures that hold the lenses in alignment. The new set of lenses expands the telescope’s viewing window about 16 times, enabling DESI to map about one-third of the visible sky several times during its five-year mission.